Each area has certain elements to show you how and where things fit. I introduce the elements in the following sections. For a bird’s-eye view of this discussion, see the figure. 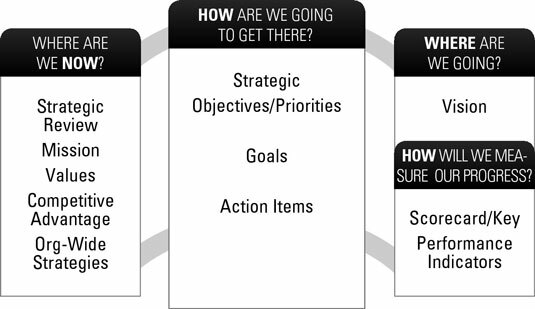 Purpose-driven: A plan based on a mission and a real, true competitive advantage is key. Without it, what’s the point of the plan or the organization? Integrated: Each element supports the next. No objectives are disconnected from goals, and no strategies sit all alone. Systematic: Don’t think of the plan as one big document. Instead, give it life by breaking it into executable parts. Dynamic: The plan isn’t a static document but a living one. Holistic: All areas of the organization are included. Don’t plan based on departments first because you risk limiting your thinking. Plan by thinking about the organization as a whole entity and then implement on a department-by-department basis. Understandable: Everyone gets it. If anyone, from the top of the organization to the bottom, doesn’t understand the plan or how he or she fits in, it won’t work. Realistic: You can implement the plan. Don’t over plan. Make sure you have the resources to support the goals you decide to focus on.